Select the item on the map. The attribute panel for the map item opens (for example, “Administrative division”). — Indicate or change center of item. The button is only present for “Administrative unit” categories of items (See section3.2.3. The drawing of the center of the administrative unit) and “Vegetation item” (see Section 3.9.3. Drawing the center of the vegetation item). — Add an external polygon. Launch the add external polygon mode (for the item you are editing). — Add an internal polygon. Launch the add internal polygon mode (for the item you are editing). — Snap to other map items mode. This button snaps the vertexes of the new item to neighboring polygons that were drawn earlier. This mode is used if, for example, you are drawing administrative divisions that have shared borders. — Polygon selection mode. This button is only available for items that consist of several polygons. It lets you switch between them and highlight the one you need. See section 2.7.4.2.7. Special concerns when editing items consisting of several polygons. — Advanced mode. Starts the advanced polygon editing mode in which you can edit the shape of an existing polygonal item and create new polygons as part of the item that is being edited. You can delete a vertex that you positioned incorrectly. 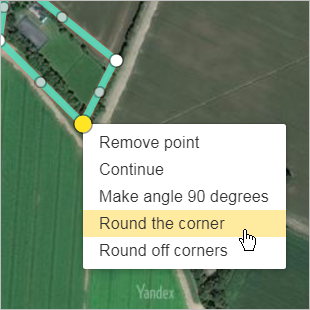 After you delete the vertex, you can continue editing the polygon. Click Save. Your changes will be saved. You can add a vertex to correct your drawing of an item. 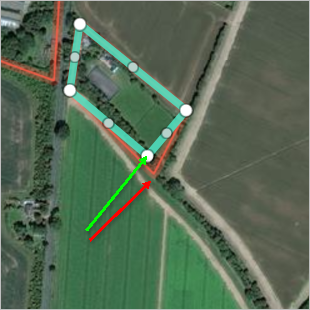 After you add vertexes, you can continue editing the polygon. You can make an angle 90° if you did not manage to draw a perfect right angle yourself. After you make the angles right, you can continue editing the polygon. The general rules for drawing curved sections of items state that corners should be rounded. After you round your item's corners, you can continue editing it. Select the item on the map. 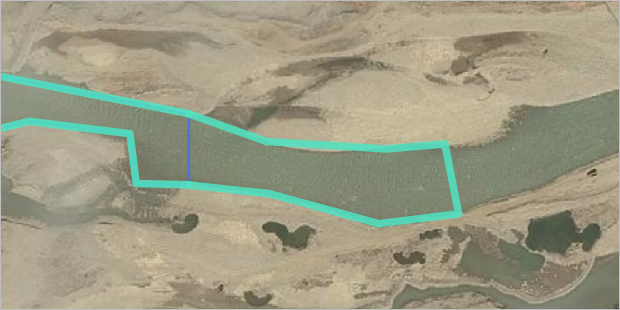 The attribute panel for the map item opens (for example, “Reservoir”). Select the item on the map. 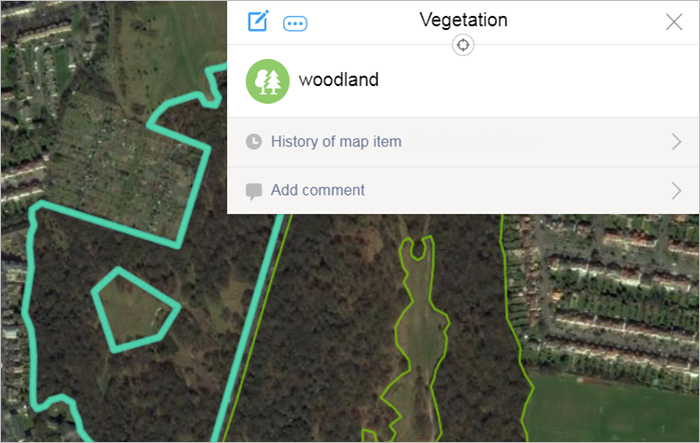 The attribute panel for the map item opens (for example, “Woodlands”). 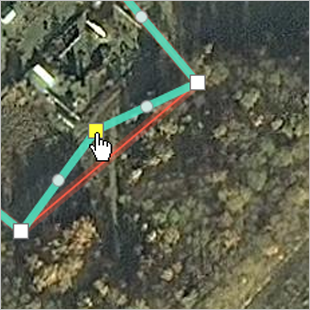 Click (Polygon selection mode) in the local toolbar. — Drag-and-drop mode. You can drag the polygon to a new position without changing its shape. When you drag the polygon, make sure not to disrupt the relative positioning of the internal and external polygons: the internal polygon can't intersect with the borders of the external one. — Redraw. Deletes the internal polygon (but leaves its outline visible) and lets you re-draw it. — Polygon selection mode. The button is present only for items that have several polygons, and it allows you to switch between them, selecting the one you need (see Section 2.7.4.2.7. Special concerns when editing items consisting of several polygons. Edit the shape of the selected polygon similarly to how you edit the shapes of other polygons. See section 2.7.4.2.1. 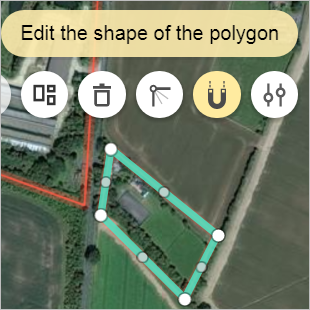 You can edit the shape of a polygon without changing its contents. Delete the selected polygon by clicking Delete polygon . 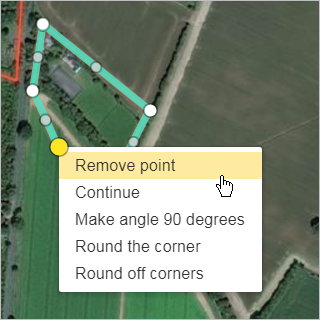 Drag the selected polygon by clicking Drag . 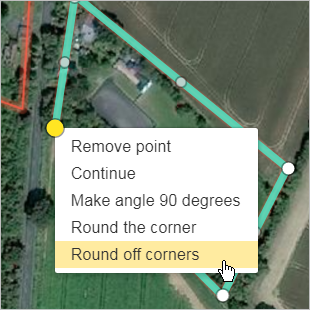 Redraw the selected polygon by clicking Redraw . "Editing" primarily refers to the alteration of the item's shape. The techniques that are used to work in this case are identical to the techniques that are described in section 2.7.4.2.1. You can edit the shape of a polygon without changing its contents. When you click (Delete) the selected polygon will be deleted. 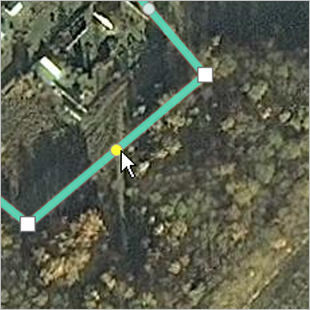 You should keep in mind that at least one polygon should remain after you delete a polygon from a map item. The last polygon of all those that form part of an item can only be deleted together with the item itself (see Section 2.10.6. Item: undo edit, report to moderator, delete item; get link to item). — Add/exclude existing sections mode. 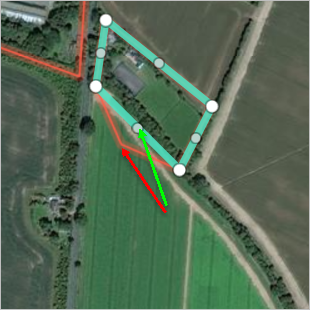 When this mode is active, clicking on sections of the border will either add them to the map item or exclude them from it. — Draw new polygon sections mode. 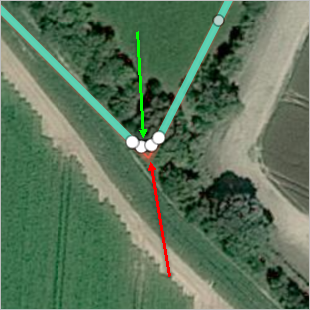 In some cases you may need to join (merge) two or more polygons into one and delete the borders between them. 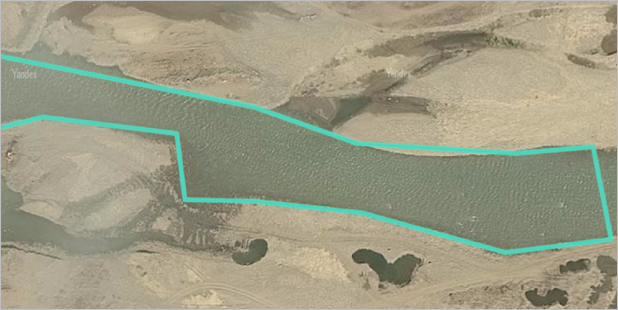 For example, this may be necessary it you are drawing a river using a polygon (see 3.10.1.3.5). You can add a new polygon to the part you drew by deleting the border between them. 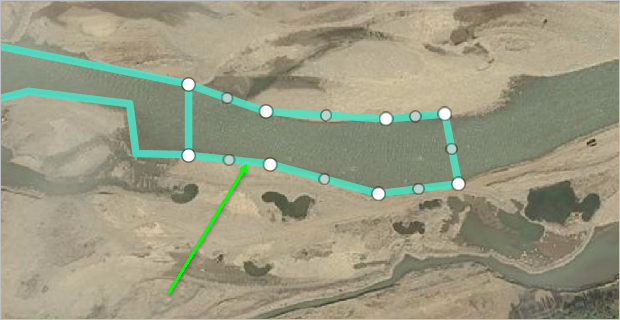 Select the river polygon that you drew and click Edit in the attribute panel that opens. 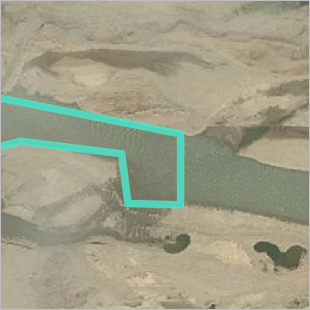 If you join the river polygons and then delete the borders between them, you can turn the river (or another item that you need to merge polygons to form) into one polygonal item. There are several reasons why you may need to split a polygon into parts. 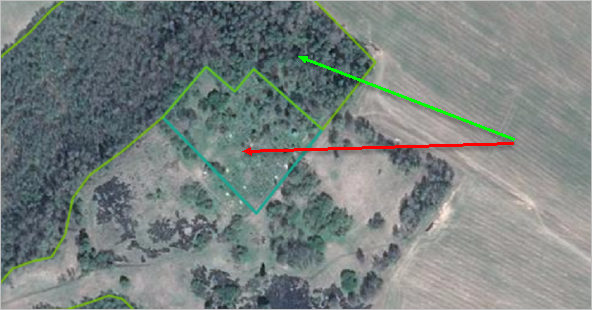 For example, you may need to select different types of vegetation polygons. After you divide the polygon, you can continue editing. Click Create and select the appropriate item type (“Cemetery”). Click (Add/exclude existing sections mode). 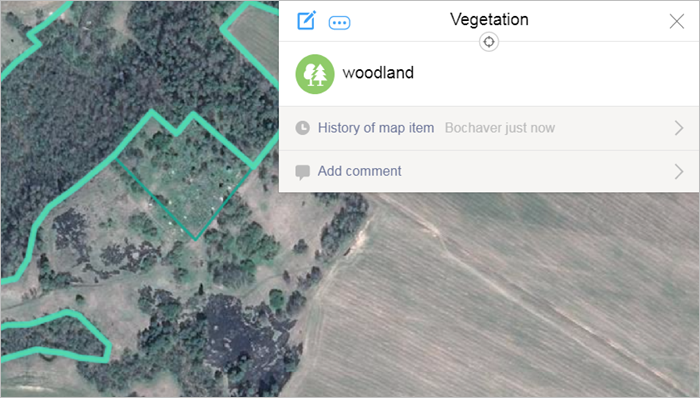 Select the old polygon (woodlands) on the map. Tap Edit . The item will switch to editing mode. The polygon will switch to advanced editing mode. Click Add/exclude existing sections mode .